Recipe, photography and styling by Tanya Zouev. Once upon a time in a former life I was a waitress and bartender. It was a job I quite enjoyed as I had the opportunity to watch professional kitchens in action and practice my social skills on unsuspecting customers. The one thing I didn’t like was being stuck on a daytime shift in the bar when you were lucky to pull one beer an hour. The rest of the time you were expected to wash and polish every damn glass in the joint, which was perfectly clean to begin with. So to alleviate the boredom I came up with the brilliant idea that I would convince my boss to let me rewrite the entire cocktail menu, he agreed. From that point on I was the self-appointed cocktail recipe developer of the hotel and I would spend much time during those boring day shifts concocting drinks which would (hopefully) sell themselves. And thankfully, a lot of the time they did. Fast forward over a decade, I’m still the cocktail maker at parties for friends and family. I actually quite enjoy this, even though I do tend to get placed behind the “bar” for most of the night. If it’s one thing I love it’s talking to people and what better way than either cooking for them or even better, making them drunk. Yes, I indeed have an evil streak in me. Something else I enjoy very much is making alcoholic beverages from unusual ingredients. Give me cucumbers, coriander, chillies and hard spirits and I’ll give you a cocktail to remember. In my opinion pomegranates and mint go together like The Roadrunner and Wile E. Coyote, except instead of fighting they co-exist in perfect harmony. The tang of the pomegranate molasses and seeds floats gently amongst the sweetness of the ginger beer and the spicy chai tea. I’ve chosen vodka for this drink because I knew it wouldn’t subdue any of the flavours, instead it enhances them to make a refreshing and festive summer tipple. 1. Fill a highball glass with crushed ice and place a few mint sprigs along the inside. Pour the pomegranate molasses into the bottom followed by the vodka, chai tea and top with ginger beer. 2. 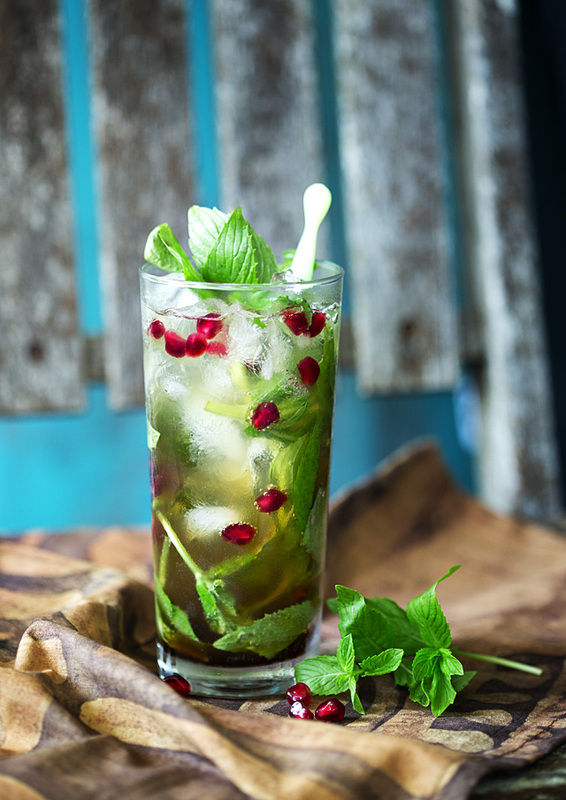 With a straw or a swizzle stick crush the mint leaves to release their flavour. 3. Break open a pomegranate, if you don’t know how to take a look at this YouTube video. Sprinkle the seeds over the cocktail and serve. 4. The pomegranate seeds will eventually sink to the bottom which is lovely because as you finish the cocktail you get to crunch the drunken seeds. Virtually all the props for this shoot were pulled out of hard rubbish council clean-ups. I was delighted to unearth the weathered and moss-covered wooden garden chair a few weeks ago off a kerbside. The background is a weathered piece of veneered wood which I painted turquoise. The highball glass was put out by a neighbour in a box to go to the tip as was the fabric which I sewed up to make a napkin. The only thing that didn’t come out of the trash was the vintage swizzle stick, I found a packet of them at the local Goodwill. I go with mint like the roadrunner and Wyle E. Coyote … but not in a good way. However, I absolutely LOVE the remaining ingredients so pour me a glass and I will be quite happy. OMG this tastes so delicious! This is a gorgeous and refreshing beverage! I will be brewing ginger beer this week so I am excited to try your drink recipe with my homemade concotion. Very pretty and I bet delicious! I’m sure it will taste even better with home-brewed ginger beer than the commercial variety. Enjoy your cocktail and be sure to stop by again. This looks perfect for the Holidays. Can’t wait to try it!